Only that I thought about checking through my junk mail last night, did I stumble upon an e-mail from one Stuart Bannocks of the UK. The subject line read "Broaching Brooch or Badge", that seemed pretty harmless, so I marked it as safe and proceed to click on the link that was presented to me. Stuart has been making a Badge a day since the 11 May 2009. About 20 days before I decided to start mine. Stuart is a designer and has no jewellery experience despite the fact he went to a school in the uk called Goldsmiths (apparently they don't even have jewellery as a subject - how cool is that). Now for the moment, I feel like I'm in a bit of a non place. This guys stuff rocks. It smacks of character and awesome ideas. Truthfully I feel a little inadequate and gobsmacked by the whole thing. 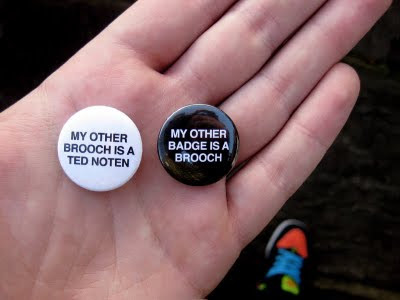 Stuart has been making badges, and I, have been making brooches. Is there much difference in it? Is something only something because you choose to call it that (Ruudt Peters anyone?)?? Much of what Stuart has been making are badges (round plastic covered button with prefabricated parts), but there are clearly times when he pushes the idea and medium and they no longer stay a badge but perhaps become a brooch or something else entirely. Either way, he has started a dialogue, and who doesn't love one of those. Since I had no control over the making of these badges, just what was to be written on them, I was a little disappointed when I received them (all the way from the US of A) that they were not made very well. I wanted them to be so shiny and perfect, just like a Noten brooch, but alas they look a little rough around the edges (one is actually missing its plastic cover). On further consideration, i'm starting to embrace their faults, because they are nothing like a Noten brooch, and thats kind of the point. Now these are in an Limited Edition off 11 and I'm willing to trade. What have you got worth one of these super collectable and desirable badges? Just what I thought, you would love too. A few months ago I was approach by the lovely ladies from Studio 20/17 to curate a special satellite Christmas show for them. 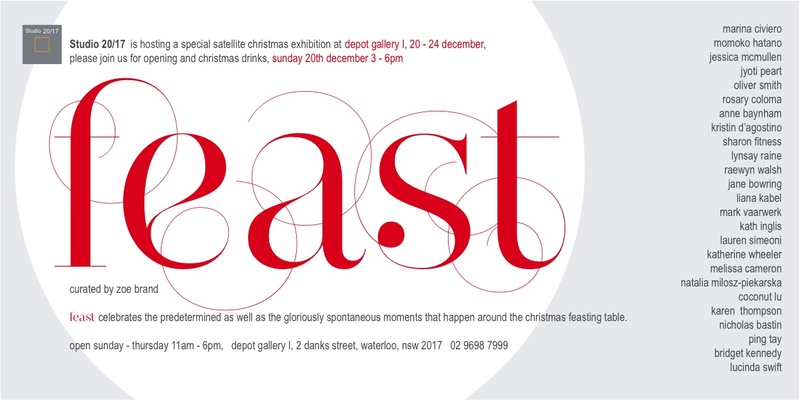 Feast, which is due to open in a little over 3 weeks (YIKES!) on the 20th Dec, has been a great experience and huge learning curve. 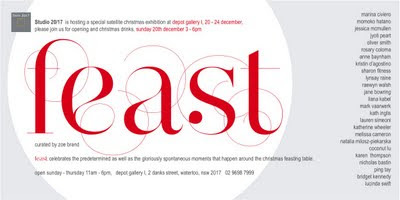 Invited participants include established and emerging jewellers from Australia and also a promising fresh crop of exciting and experimental works from New Zealander jewellers. Two of these New Zealanders (Sharon Fitness & Lynsay Raine) have been keeping a close eye on my 365 project and in an inspired moment came up with a particularly nifty brooch idea. "Here is a brooch that Sharon made today, after an exciting car, train, walk, bus, walk journey into work today. Inspired by the need to have your ticket ready for the transport people at every train stop. We thought you might like it." I hope you are all enjoying this festive season, I've been cracking on with some pretty ugly christmas decorations as my material of choice, so look out soon for lots of gold and glittery brooches to come. 101 - Reclaimed Material (Styrofoam packing bits) and Given Material (green wooden balls) and Bought findings. 100 - "only 265 more to go - better eat my sausages and eggs" - Bought Material (plastic food, from the super chef's play set) and bought finding. 99 - Reclaimed Material (small felt pom poms) and bought cameo finding. 98 - "an eraser - for when you need to erase things" - Reclaimed Material (sold as a 'toy' that you can put in DIY christmas crackers - "wow what did you get in your bonbon? an eraser?! COOL") and a bought finding. 97 - Reclaimed Material (cut from the cardboard packaging of christmas decorations) and Bought finding. 96 - Reclaimed Material (plastic cocktail things that sit on the edge of your cup) and a bought finding. 95 - Reclaimed Material (the cardboard bits left over when you punch out a hole - these ones came from rolls of christmas ribbon) and bought finding. 94 - "U-G-L-Y" - Found Material (orange plastic string), Epoxy Resin and bought finding. NB. This is really really ugly. 92 - "stay gold, ponyboy, stay white gold" - Bought Material (acrylic sign), Stainless Steel and Aluminum. Sorry for all these weird homages - but sometimes one must tip ones hat in the direction of perfection. 86 - Given Material (once again from the awesome kristin - i love receiving new materials (hint hint) - plastic tray from a chocolate container) and Stainless steel and Aluminum. ps. there will be more little green ball brooches to come - they just haven't been finished - man I LOVE THIS GREEN! 80 - 'Incase of an emergency" - Given material (a Durex given to me from a friend, who clearly thought i needed it more than she did! ha! Thanks lady!) and Stainless Steel. 78 - Given Material (Florist wrapping that came from some flowers that were meant for my co-worker, but she had left for the week, so i got to take them home YAY) and stainless Steel. 77 - 'last chance learner' - Found Material (the 'L' cut from a learners driving sign) and bought cameo finding. 76 - "tick tock" - Reclaimed material (the second hand from a clock that my sisters gave to me on my 14th or 15th birthday, the clock finally coming to its untimely death at the hands of my flat mate and a tennis ball) and bought finding. Sorry for the extended silence, damn internet capping, but back on board now. enjoy. I started this project a few months ago as a way to power through the all those 'lost' moments of the recently graduated. You know the ones... they sometimes keep you up at night.... and go a little something like.... "what am I doing?... what did i just do with the last 3 years of my life??... who the hell would wear that?? you can't even wear that?? oh you're a jeweller - can you fix my diamond ring?? yeah its made out of paper.... eek!" I have a nasty suspicion that these feelings don't ever go away, sometimes they are louder and other times they are just a whisper on the wind. It seems that this little (*cough*cough*) project has taken on a life of its own. I would never, even in my wildest dreams, have imagined that it could gain so much attention. The latest bout of blog love as been amazing if slightly daunting (these sites have so many members/visitors, eek!). 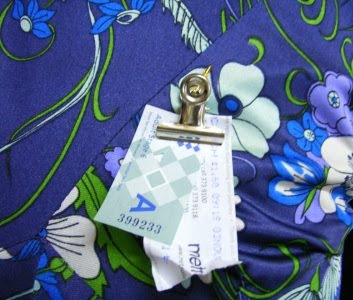 ....remember if you have any spare/random materials lying around that are crying out to be made into a brooch drop me a line, as they say, nothing like a bit of fresh meat to liven things up. 72 - Given Material (golden insert from a chocolate box (sans chocolate) and Plastic cherries) and bought findings. 71 - "I think we need a bigger boat" - Found material (plastic guard from truck) and Given Material (plastic Toy Shark - Thanks MY) and Stainless Steel. 06/08/09 - Reclaimed Material (cardboard pen (LAMY) boxes) and bought finding. 05/08/09 - Reclaimed Material (cardboard pen (LAMY) boxes) and bought finding. 04/08/09 - Reclaimed Material (balls of Silica-gel from a desiccant satchel) set in epoxy resin, aluminum and stainless steel. I’d like to tell you a bit about myself. I’m about average height, I wear glasses, I like to skim stones and take long walks in the park. 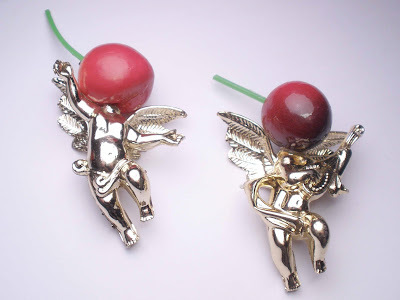 The area of the arts in which I am trained and identify with is that of Contemporary Jewellery. I also like to drink beer and cider, so if you are ever in the area and feel the need to talk Jewellery (or the state of the Australian cricket team), drop me a line and we can converse well into the night about this, that and anything else you have on you mind. 365 Brooches - Inspired by some crafty people, I have decided to create my own '365 project', essentially making a brooch a day for one year. This project will be used as a means of exploring ideas, processes and found materials that I have collected, nay hoarded over the years. I see these 'brooches' as quick 'sketches' of ideas rather than actual finished pieces, and as such they may only take a few minutes to make, but allow for the ideas in my head to become some form of a reality. They may not be pretty, they may not be practical and they may be something else entirely but they are a start, and what better place to begin than that.